Can SwitchResX disable a display ? SwitchResX includes a function to remove a display from the System's list of managed display. 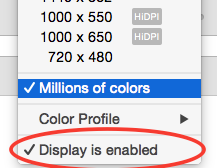 This means the display in question, once deactivated, will not be visible from the System or from any application. Only SwitchResX will be able to activate the display again. Please also note that if you have mirroring enabled, the menu item will NOT show. So be also sure to disable video mirroring. There are however some compatibility problems on Yosemite and Mavericks: see this section of the FAQ.